The margins have gone against the Clarets this term, according to goalkeeper Tom Heaton. The margins have gone against the Clarets this term, according to goalkeeper Tom Heaton. On the way to promotion from the Championship last season, Sean Dyche’s side edged games by a solitary goal on 14 occasions. 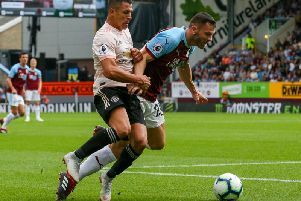 However, during the current campaign, the Clarets have experienced the flip side of the coin after losing nine fixtures by a single goal margin. “We’ve certainly given it a good effort,” he said. “We never felt like we were too far off. “The frustrating thing is I think we deserve a little bit more and deserve to stay in the league. That’s probably half the reason why it’s tough to swallow. Heaton added: “Last season we landed the right side of them. Unfortunately this season, probably too many times, we’ve landed the other side of it.